At least 780 million people do not have access to clean drinking water, some 2.5 billion people lack access to safe sanitation systems, and 2-5 million people – mainly children – die from preventable, water-related diseases every year. Widespread scarcity and lack of access to adequate water supply and sanitation threaten socio-economic development and national security for countries around the world. People around the world share and exchange water directly through connected river and groundwater basins and indirectly through global trade, i.e., virtual water. Multinational companies are major players in both the provision and use of water resources. Climate change is altering the availability, timing, quality, and demand for water around the world. Despite this acknowledgement, our current global water governance system was established when approaches to water resource development and management were different than those encountered today. This is a growing, albeit still nascent, interest in examining new and/or improved structures and approaches to water governance that more effectively meets the scope, scale, and complexity of persistent and new global water challenges. A new report from the Pacific Institute tackles the issue by examining some of the deficiencies in current global governance efforts. Among these deficiencies are that intergovernmental organizations lack clear leadership and coordination; water sector funding is inadequate and too narrowly focused; and knowledge and technology transfer remain largely top-down efforts. Despite these inadequacies, we find that new thinking and innovative technologies provide significant opportunity to improve governance efforts to more effectively address 21st century water challenges. Securing a sustainable funding source and stronger mandate for intergovernmental organizations to promote greater collaboration among organizations engaged in water governance. Developing financing mechanisms to support ongoing operation and maintenance costs of water-related infrastructure and the people and institutions needed to effectively manage it. Promoting capacity building and increasing participation in water management for local, regional, and national government entities and civil society groups. Adopting new standards, codes, and best practices for water resource development and management to promote greater transparency, participation, and accountability. 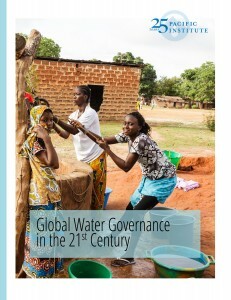 We note that the global dimensions of water governance are difficult and complex issues. Such governance, and the institutional structures that accompany it, are complicated by local, regional, and national factors. Indeed, there is no single practice or policy that will “solve” the water challenges facing the world today. There are, however, several paths forward to more efficient and effective structures and policies to promote a more robust and sustainable approach to global water governance in the 21st century.